Rose City Reader wrote a good summary of the weekend's events and Caribou's Mom has a great photo of the group (I'm in green) and some of the highlights of the tours. Dreadlock Girl also has some fantastic photos! The Powell's City of Books tour was awesome and I can't wait to get back down there and do a really good shop without a five year old attached to my leg. This was really a great opportunity to talk about books and blogging and I hope that some more of you PNW bloggers join us next time! In A Glass Darkly by Sheridan Le Fanu - I have been looking for a nice used copy of this book forever and found an Oxford edition at Powell's. I will be reading this for my "well-read" challenge and it's one that I'm really excited about! The Mammoth Book of Dickensian Whodunnits - Since I finished my historical whodunnits during the Mystery Read-A-Thon, I needed a new book of short stories and this one looks fun. I hadn't seen it before but Powell's had it on sale. The Last Queen by C.W. Gortner - You probably recognize this one as the story of Juana, daughter to Isabella and Ferdinand of Spain. I've decided that I really need to become more familiar with Spanish history as a whole to get in touch with my heritage and understand my ancestors. This is another small piece of the historical timeline. Three Junes by Julia Glass - I had never heard of this one but it got shoved in my hand and I was told I had to read it. :) It's a National Book Award Winner and looks to be a quick read. The Hearts of Horses by Molly Gloss - Molly Gloss is the author that we met in Portland and even though her book is not in my standard genres, she was just so fantastic at talking about her writing and her books that I got a copy (signed!) and I am really looking forward to reading it. Malice by Lisa Jackson - This book didn't come from Portland ... it actually came from Redding, CA. I won it from Caribou's Mom during the Mystery Read-A-Thon and it was in the mailbox but it did end up coming back in the house with me after our vacation. Sneaky little thriller. Horton Hatches the Egg (a U.K. edition!) and the Horton Hears a Who! Pop-Up-Book by Dr. Seuss - Z is on a big Horton kick right now and when he found out there was a second book, he started reminding me constantly that we needed to go buy a copy. Miss Bindergarten Gets Ready for Kindergarten by Joseph Slate (ill. Ashley Wolff) - Z starts kindergarten this week and obviously he's been thinking about it because he picked this one off the shelves all by himself. Billy's Picture by Margret and H.A. Rey - I grabbed this one because I've never seen any of the non-Curious George books by this duo. It's simple and adorable. T even grabbed a book at Powell's -- Tom Swift and His Flying Lab by Victor Appleton II, an old 1950's Hardy Boys type book. We had a great time with the bloggers and T, Z and I had fun exploring Portland. It's got a lot of things in common with Seattle but is definitely its own town. Powell's is both heaven on earth and the worst place ever to be. I've never walked out of there with a clean conscience! I wish I could have attended the event with you all as well - but hopefully it will happen again sometime soon. I'm so glad you came down to Portland! It was really fun to meet you. It was great to meet you and spend time doing book-y things while you were here. I don't think I actually SHOVED Three Junes into your hands. Well, I can be bossy, so maybe . . . Anyway, you will really like it, I think. Sounds like you all had a great time! 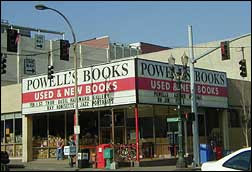 I really want to visit Portland, and especially Powell's someday. Wendy, Ali, Rose City, Trish - It was so fun to meet everyone and discover some new blogs! Ophelia - I will definitely drag you along next time. I'm pulling for a Seattle meet-up. Tanabata - It's not too far from Vancouver so next time you are out visiting Canada, maybe we can take a road trip!